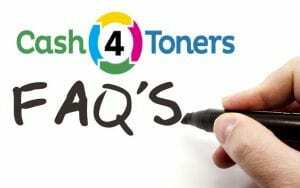 Have a question about what products Cash4Toners buys? Take a look below at our frequently asked questions to find the answers you seek. Check out the full list of toner brands we buy on our What We Buy page. Ready to make some easy cash? Head over to our toner buy back form to get started! How can Cash4Toners help me? If you’ve got unused toner, we’ll pay you a fair price for it. How much cash will I get for unused printer toner? Prices vary depending on the manufacturer, original retail price, proximity of the expiration date, and other factors. Cash4Toners has a simple online form with drop-down menus that allows you to choose the brand of toner cartridge, part number, condition, and quantity. A couple clicks and that’s it! What if my toner box is damaged? Will you still buy it back? If the box has some damages, we will pay according to its condition. Please make sure when filling out the form, to select the star most fitting to your item. Do you buy back ink jet cartridges? We only purchase sealed inkjet cartridges that have at least 6 months before expiring. The expiration date is usually displayed on the back of the box. I have compatible, generic, or remanufactured toner...will you buy that back? We do not buy out-of-market, compatible, generic, or remanufactured toners. As mentioned before, all toners must be original OEM from major brands. Do you buy used or empty toner cartridges? We do not buy used or empty toners. Toners that are leaking have missing pull tabs, have been installed or attempted to be installed, will not be accepted. How will I get paid for my unused printer toner? Cash4Toners pays via PayPal or check. How much will it cost me to ship my toner? Cash4Toners provides a free shipping label for you to use when mailing your toner cartridges. What brands of printer toner do you buy back? Cash4Toners buys back all brands of popular toner, including Brother, Canon, Dell, HP, IBM, Konica Minolta, Kyocera, Lexmark, Okidata, Panasonic, Ricoh, Samsung, Sharp, Toshiba, and Xerox. Do you buy anything else beside toner cartridges? We specialize in purchasing surplus, overstock, clearance, closeout, and liquidation inventory of genuine, OEM printer supplies. We purchase ink and toner cartridges for copiers, printers, fax machines and multi-function business machines. Give Cash4Toners a call at (800)-215-4761 or drop us a line at selltoner@cash4toners.com! We are based in Northvale, NJ, only 15 minutes from Manhattan. Plug us into your GPS and pay us a visit! Our customers include small businesses, corporations, schools, and government offices. How long has Cash4Toners been in business? Cash4Toners has over ten years of experience in the imaging supplies industry. We pride ourselves on high quality customer service and a long-lasting relationship with our customers.